Welcome to the Alpha Kappa Alpha Sorority, Incorporated Orlando Chapter's webpage. Alpha Kappa Alpha Sorority, Incorporated has been an exemplary organization for over 111 years. It has served the African American community and abroad with the ultimate purpose of service to all mankind. As the President of the Orlando chapter (Delta Omicron Omega-DOO), it is my pleasure and great honor to continue that service to Orlando and the surrounding areas. Our chapter has been a beacon to the community since 1947 and continues to lead the way in providing programs of service. The Orlando Chapter promotes all of the programs of our International organization and our current International President's five program targets by "Exemplifying Excellence Through Sustainable Service". Our chapter's signature programs include: Charmettes Teen Club of Orlando - our mentoring program for middle and high school girls; Hiawassee Elementary School - Weekend Feed the Children Project; and Orlando Union Rescue Mission - Partnership. Through our Petals of Hope Foundation, we sponsor a Senior Luncheon serving over 350 senior citizens; our Taste the Hope program provides Transport to Care for women with breast cancer who can't afford transportation to medical appointments; and five scholarships to qualifying high school seniors. As I follow in my mother's footsteps, Mrs. Alfreda Gary - past President of the Orlando chapter (two terms) and former Cluster II Coordinator, I have adopted my signature theme "DOO Delivers". It is my hope and prayer that with the help of over 180 members of our chapter we will indeed answer the call to action by delivering service to all mankind. Visiting members-come early for breakfast. Alpha Kappa Alpha Sorority, Incorporated is not responsible for the design content of these web pages. 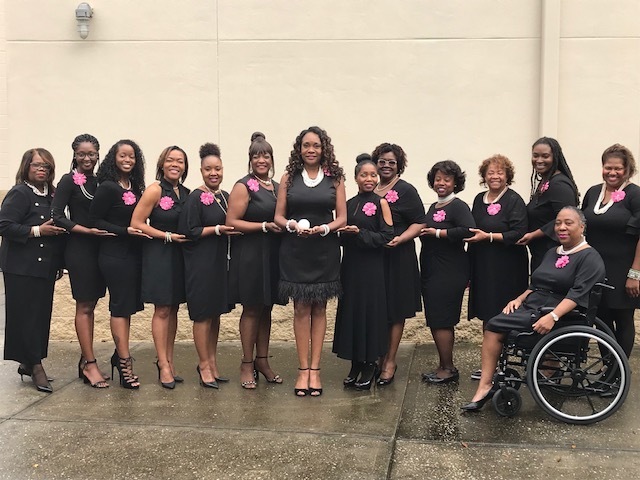 The design content of these pages are the sole property and responsibility of Delta Omicron Omega Chapter of Alpha Kappa Alpha Sorority, Incorporated. This site is best viewed in Mozilla Firefox, Microsoft Internet Explorer 6 and above, or Safari browsers at 1024 x 768 resolution.